The term “cellulite” was coined in 1973 to refer to the dimpled appearance of the skin that some people have on their hips, thighs, and buttocks. Cellulite is a kind of tissue in the subcutaneous layer of the skin that contains constricting bands of connective tissue. This connective tissue, which varies in thickness and is laced with fat cells, is held in place by a network of fibers that serves to protect our body; cushioning our muscles and organs. It is surrounded by a liquid that both nourishes it and provides it with an effective waste disposal system. When all is working well in the system, waste products and excess liquid are removed and smooth curves result. However, when excess fat, fluids and toxins are trapped in the skin, the connective tissue thickens and hardens, giving a dimpling effect. On top of this, as we age, our skin thins, further resulting in the rippled appearance of cellulite. Cellulite afflicts about 90% of women over 30 and many men. Easily mistaken for fat, the problem actually lies in the skin. Even thin women can have lumpy, unsightly cellulite. The dimpling effect is primarily caused by fibrous bands that are not as elastic as the rest of the skin. This appearance is much more common in women than in men because of differences in the way fat, muscle, and connective tissue are distributed in men and women’s skin. Although female hormones may play a role in contributing to this fat distribution, cellulite is not treatable by hormone therapy. How can Cellulite by Thermage help my cellulite? ✓ Underlying problem: As we get older, the fibrous septae lose elasticity, becomes contracted and tugs the overlying loose skin downwards, causing dimpling. Thermage Solution: Radiofrequency restores the elasticity of the fibrous septae and strengthens the overlying skin at the same time to improve the “orange-peel” appearance. ✓ Underlying Problem: Microcirculation in the tissue is reduced with age and hardening of the fibrous septae and becomes inadequate to maintain healthy fat, connective tissue and skin metabolism, resulting in further worsening of cellulite.Thermage Solution: By volumetric heating, the perfusion rate immediately increases, improving the health and metabolism of the treated tissues and promotes tissue repair. How is this treatment different from Body Shape by Thermage? Body Shape by Thermage uses a ThermaTip DC (DC for ‘deep contouring’) and is suitable for firming and shaping non-cellulite areas of the body. Cellulite by Thermage uses a ThermaTip CL (CL for ‘smoothening and contouring’) and is suitable for smoothening the dimples as well as toning of cellulite-stricken skin. If you are unsure of which treatment you need, always make an appointment with our doctors at SW1 Clinic for a consultation prior to treatment. What is Cellulite by Thermage procedure like? No topical or injected local anesthetic, sedative or pain killers are necessary in most cases. An ink grid will be placed on your skin so that treatment energies are applied evenly. A clear fluid is applied to the treatment areas ensure good electrical and thermal contact with the skin and the treatment tip. With each energy pulse to the skin, a combination of cooling spray and RF energy is delivered. The spray continuously cools the outer layers of the skin to prevent overheating of the surface skin. Depending on your pain threshold, you may feel mild warmth, intense warmth (heat), or possibly very brief pain with each application of energy. Throughout the procedure, Dr. Mani or the Physician’s Assistant performing the procedure will ask for feedback from you about your perception of heat and the level of discomfort you are experiencing. RF levels will be adjusted up or down accordingly so that therapeutic levels of heat are achieved without excessive discomfort. Treatment time varies according to area(s) treated and the number of times the tip is passed over the skin. A Thermage procedure can take between 1 to 2 hours depending on the area treated. Most patients see improvements after 1 session. Depending on the severity of their underlying cellulite and their desired outcome, some patients may undergo a repeat session for an enhanced outlook. For maintenance, we recommend our Cellu-Melt skin firming treatment that delivers smoother skin on any part of your body in under 60 min. Some patients see an immediate improvement in the dimpled appearance of the treated area. Most will see gradual improvements over 6 months after the first session. Is there any discomfort involved? Patients will feel a deep heating sensation with each pulse of the Thermage. Our doctors will adjust the treatment level of the procedure according to the discomfort of the patient. 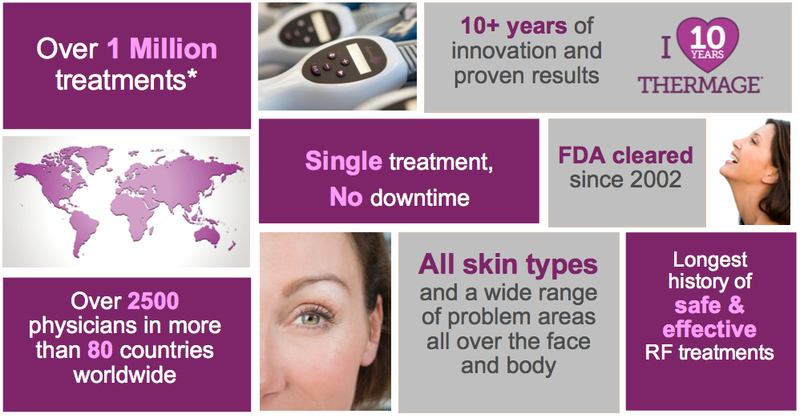 At SW1 Clinic your treatment is always customized to allow you maximum comfort, while ensuring great results.